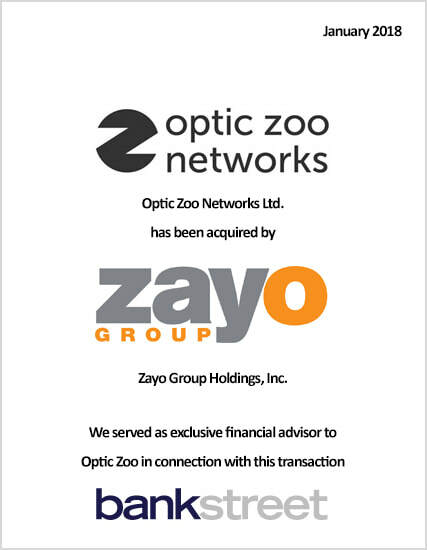 ​“The sale of Optic Zoo to Zayo marks the second opportunity that I’ve had to work with Bank Street following their successful work on the sale of Black Rock Cable to Wave Broadband and I couldn’t be more pleased with the outcome of this transaction. They had the market knowledge necessary to perfectly position our business and the relationships and reach to create a highly competitive sale process for the company with financial and strategic buyers both in Canada and the United States. © Copyright Bank Street Group LLC All Rights Reserved.